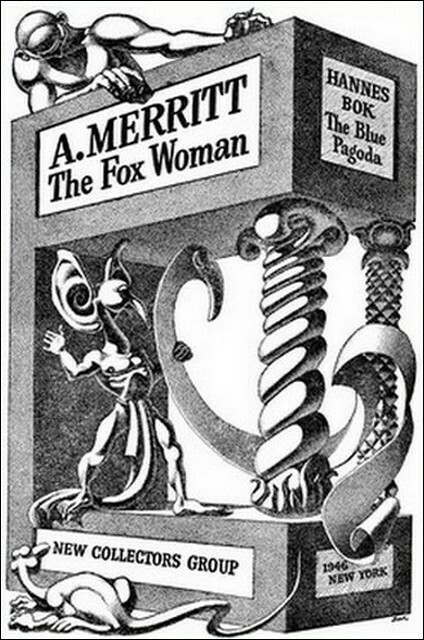 "The Fox Woman" and "The Blue Pagoda,"
"The Fox Woman and Other Stories"
THE ancient steps wound up the side of the mountain through the tall pines, patience trodden deep into them by the feet of twenty centuries. Some soul of silence, ancient and patient as the steps, brooded over them. They were wide, twenty men could have marched abreast upon them; lichens brown and orange traced strange symbols on their grey stones, and emerald mosses cushioned them. At times the steps climbed steep as stairs, and at times they swept leisurely around bastions of the mountain, but always on each side the tall pines stood close, green shoulder to shoulder, vigilant. At the feet of the pines crouched laurels and dwarfed rhododendrons of a singular regularity of shape and of one height, that of a kneeling man. Their stiff and glossy leaves were like links on coats-of-mail... like the jade-lacquered scale-armor of the Green Archers of Kwanyin who guard the goddess when she goes forth in the Spring to awaken the trees. The pines were like watchful sentinels, and oddly like crouching archers were the laurels and the dwarfed rhododendrons, and they said as plainly as though with tongues: Up these steps you may go, and down them—but never try to pass through us! A woman came round one of the bastions. She walked stubbornly, head down, as one who fights against a strong wind—or as one whose will rides, lashing the reluctant body on. One white shoulder and breast were bare, and on the shoulder was a bruise and blood, four scarlet streaks above the purpled patch as though a long-nailed hand had struck viciously, clawing. And as she walked she wept. The steps began to lift. The woman raised her head and saw how steeply here they climbed. She stopped, her hands making little fluttering helpless motions. She heard voices beyond the bend of the bastion, voices guttural and sing-song, angry and arguing, protesting and urging. She heard the shuffle of many feet, hesitating, halting, but coming inexorably on. Voices and feet of the hung-hutzes, the outlaws who had slaughtered her husband and Kenwood and their bearers a scant hour ago, and who but for Kenwood would now have her. They had found her trail. She wanted to die; desperately Jean Meredith wanted to die; her faith taught her that then she would rejoin that scholarly, gentle lover-husband of hers whom she had loved so dearly although his years had been twice her own. It would not matter did they kill her quickly, but she knew they would not do that. And she could not endure even the thought of what must befall her through them before death came. Nor had she weapon to kill herself. And there was that other life budding beneath her heart. But stronger than desire for death, stronger than fear of torment, stronger than the claim of the unborn was something deep within her that cried for vengeance. Not vengeance against the hung-hutzes—they were only a pack of wild beasts doing what was their nature to do. This cry was for vengeance against those who had loosed them, directed them. For this she knew had been done, although how she knew it she could not yet tell. It was not accident, no chance encounter that swift slaughter. She was sure of that. "A lie! Like all the lies I have been taught of—You! I am through with—You! Vengeance! Whoever gives me vengeance shall be my God!" 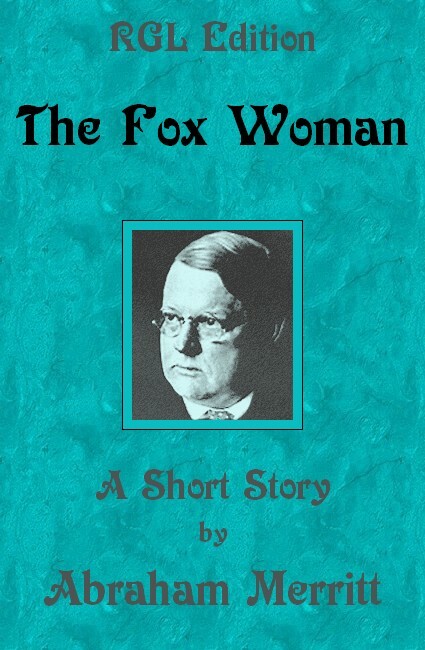 A fox stood upon the steps a dozen feet above her, watching her, barring her way. 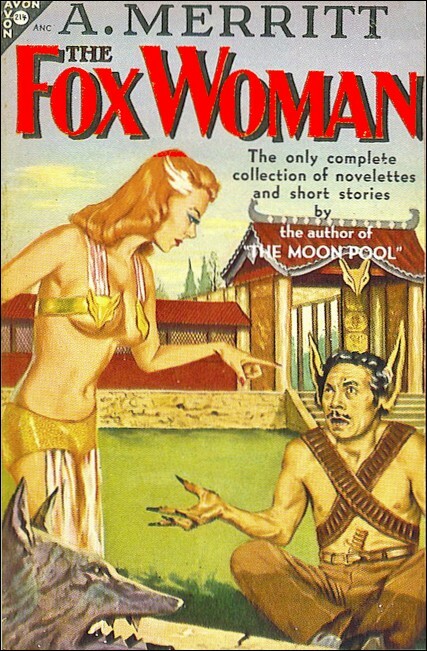 It was a female fox, a vixen. Its coat was all silken russet-red. It had a curiously broad head and slanted green eyes. On its head was a mark, silver white and shaped like the flame of a candle wavering in the wind. "Sister—you are a woman! Lead me to safety that I may have vengeance—sister!" Remember, she had just seen her husband die under the knives of the hung-hutzes and she was with child... and who can know upon what fantastic paths of unreality a mind so beset may stray. There was a sudden outburst of the guttural singsong. They were close now, her pursuers, close to the bend of the steps round which she had come. Soon they must turn it and see her. She stood staring at the fox expectantly... hoping she knew not what. The fox slipped by her, seemed to melt in the crouching bushes. It vanished. Black despair, the despair of a child who finds itself abandoned to wild beasts by one it has trusted, closed in on Jean Meredith. What she had hoped for, what she had expected of help, was vague, unformulated. A miracle by alien gods, now she had renounced her own? Or had her appeal to the vixen deeper impulse? Atavistic awakenings, anthropomorphic, going back to that immemorial past when men first thought of animals and birds as creatures with souls like theirs, but closer to Nature's spirit; given by that spirit a wisdom greater than human, and more than human powers—servants and messengers of potent deities and little less than gods themselves. Nor has it been so long ago that St. Francis of Assisi spoke to the beasts and birds as he did to men and women, naming them Brother Wolf and Brother Eagle. And did not St. Conan baptize the seals of the Orkneys as he did the pagan men? The past and all that men have thought in the past is born anew within us all. And sometimes strange doors open within our minds—and out of them or into them strange spirits come or go. And whether real or unreal, who can say? The fox seemed to understand—had seemed to promise— something. And it had abandoned her, fled away! Sobbing, she turned to climb the steps. Too late! The hung-hutzes had rounded the bend. There was a howling chorus. With obscene gestures, yapping threats, they ran toward her. Ahead of the pack was the pock- faced, half-breed Tibetan leader whose knife had been the first to cut her husband down. She watched them come, helpless to move, unable even to close her eyes. The pock-face saw and understood, gave quick command, and the pack slowed to a walk, gloating upon her agony, prolonging it. They halted! 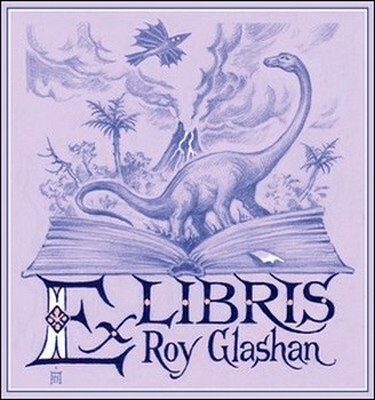 Something like a flicker of russet flame had shot across the steps between her and them. It was the fox. It stood there, quietly regarding them. And hope flashed up through Jean Meredith, melting the cold terror that had frozen her. Power of motion returned. But she did not try to run. She did not want to run. The cry for vengeance was welling up again. She felt that cry reach out to the fox. As though it had heard her, the fox turned its head and looked at her. She saw its green eyes sparkle, its white teeth bared as though it smiled. Its eyes withdrawn, the spell upon the hung-hutzes broke. The leader drew a pistol, fired upon the fox. Jean Meredith saw, or thought she saw, the incredible. Where fox had been, stood now a woman! She was tall, and lithe as a young willow. Jean Meredith could not see her face, but she could see hair of russet-red coifed upon a small and shapely head. A silken gown of russet-red, sleeveless, dropped to the woman's feet. She raised an arm and pointed at the pock-faced leader. Behind him his men were silent, motionless, even as Jean Meredith had been—and it came to her that it was the same ice of terror that held them. Their eyes were fixed upon the woman. The woman's hand dropped—slowly. And as it dropped, the pock-faced Tibetan dropped with it. He sank to his knees and then upon his hands. He stared into her face, lips drawn back from his teeth like a snarling dog, and there was foam upon his lips. Then he hurled himself upon his men, like a wolf. He sprang upon them howling; he leaped up at their throats, tearing at them with teeth and talons. They milled, squalling rage and bewildered terror. They tried to beat him off—they could not. There was a flashing of knives. The pock-face lay writhing on the steps, like a dog dying. Still squalling, never looking behind them, his men poured down the steps and away. Jean Meredith's hands went up, covering her eyes. She dropped them— a fox, all silken russet-red, stood where the woman had been. It was watching her. She saw its green eyes sparkle, its white teeth bared as though it smiled—it began to walk daintily up the steps toward her. She looked up. A woman's face was bending over her. An exquisite face... with sea-green, slanted eyes under a broad white brow... with hair of russet-red that came to a small peak in the center of that brow... a lock of silvery white shaped like the flame of a candle wavering in the wind... a nose long but delicate, the nostrils slightly flaring, daintily... a mouth small and red as the royal coral, heart-shaped, lips full, archaic. Over that exquisite face, like a veil, was faint mockery, a delicate malice that had in them little of the human. Her hands were white and long and slender. They touched Jean Meredith's heart... soothing her, strengthening her, drowning fear and sorrow. It seemed to Jean Meredith that she lay cushioned within soft, blind darkness—illimitable, impenetrable. She had no memories; all that she knew was that she was. She thought: I am I. The darkness that cradled her was gentle, kindly. She thought: I am a spirit still unborn in the womb of night. But what was night... and what was spirit? She thought: I am content— I do not want to be born again. Again? That meant that she had been born before... a word came to her—Jean. She thought: I am Jean... but who was Jean? The man said: "Soon she must awaken. The tide of sleep is high on the shore of life. It must not cover it." The woman answered: "I command that tide. And it has begun to ebb. Soon she will awaken." He asked: "Will she remember?" The woman said: "She will remember. But she will not suffer. It will be as though what she remembers had happened to another self of hers. She will pity that self, but it will be to her as though it died when died her husband. As indeed it did. That self bears the sorrow, the pain, the agony. It leaves no legacy of them to her—save memory." And now it seemed to her that for a time there was a silence... although she knew that time could not exist within the blackness that cradled her... and what was—time? The man's voice broke that silence, musingly: "With memory there can be no happiness for her, long as she lives." The woman laughed, a tingling-sweet mocking chime: "Happiness? I thought you wiser than to cling to that illusion, priest. I give her serenity, which is far better than happiness. Nor did she ask for happiness. She asked for vengeance. And vengeance she shall have." The man said: "But she does not know who—"
The woman interrupted: "She does know. And I know. And so shall you when you have told her what was wrung from the Tibetan before he died. And if you still do not believe, you will believe when he who is guilty comes here, as come he will—to kill the child." The man whispered: "To kill the child!" The woman's voice became cold, losing none of its sweetness but edged with menace: "You must not let him have it, priest. Not then. Later, when the word is given you "
Again the voice grew mocking... "I contemplate a journey... I would see other lands, who so long have dwelt among these hills... and I would not have my plans spoiled by precipitancy..."
Once more Jean Meredith heard the tingling laughter. "Have no fear, priest. They will help you—my sisters." He said, steadily: "I have no fear." "I know that, you who have had wisdom and courage to open forbidden doors. But I am bound by a threefold cord—a promise, a vow, and a desire. When a certain time comes, I must surrender much—must lie helpless, bound by that cord. It is then that I shall need you, priest, for this man who will come." A man came toward her, walking out of the shadows beyond the ancient Tang vessel. He was clothed from neck to feet in a silken robe of silvery-blue upon which were embroidered, delicately as though by spiders, Taoist symbols and under them, ghostly in silver threads, a fox's head. He was bald, his face heavy, expressionless, skin smooth and faded yellow as some antique parchment. So far as age went he might have been sixty—or three hundred. But it was his eyes that held Jean Meredith. They were large and black and, liquid, and prodigiously alive. They were young eyes, belying the agelessness of the heavy face; and it was as though the face was but a mask from which the eyes had drawn all life into themselves. They poured into her strength and calmness and reassurance, and from her mind vanished all vagueness, all doubts, all fears. Her mind for the first time since the ambush was clear, crystal clear, her thoughts her own. She remembered—remembered everything. But it was as though all had happened to another self. She felt pity for that self, but it had left no heritage of sorrow. She was tranquil. The black, youthful eyes poured tranquillity into her. She said: "I know you. You are Yu Ch'ien, the wise priest my husband loved. This is the Temple of the Foxes.